Cash chaos after shock move targeting India's "black money"
NEW DELHI -- Almost two weeks after the Indian government banned the largest bills of the nation’s currency, people are still struggling to exchange their old cash and get their hands on the new bills. More than 85 percent of India’s circulating currency was made instantly illegal on November 8, when Prime Minister Narendra Modi in a sudden and surprise televised address announced that 1,000 and 500 Rupee notes, worth about $15 and $7.50 respectively, would cease to be legal tender the next morning. 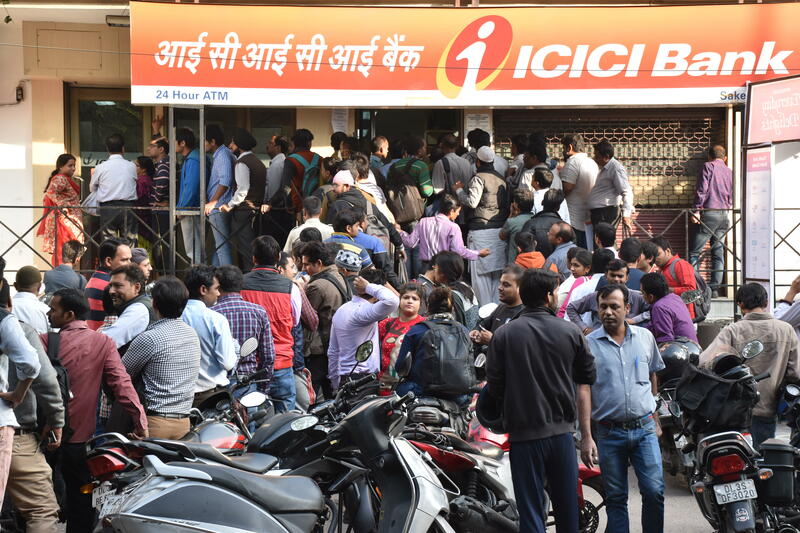 Since that moment, there have been long lines outside banks and at ATMs, and the government is struggling to help people facing the sudden cash crunch. Thousands of people have spent up to six hours outside banks to get small amounts of new notes that the government is still in the process of printing. ATMs are still being re-calibrated to dispense new 2,000 Rupee notes. Some people line up before dawn with the hope of getting cash early when the bank opens in the morning. Tempers are running high in the long lines, and scuffles have been reported in some parts of the country. Police and paramilitary forces have been deployed outside most banks and ATMs to prevent violence. Indians have until the end of this year to deposit their old cash in banks, but large deposits will bring penalties and could prompt tax investigations. The Modi government’s move was aimed at bringing into account large amounts of unaccounted-for cash -- “black money” as it’s known -- that people are believed to have hidden in their homes to evade taxes. The government says such funds can end up funding terrorist activities. A majority of Indians, however, who are not sitting on any “black money,” may be paying a big price for the sins of the few. For the thousands of farmers, labourers, traders and drivers – the vast majority of whom are paid in cash in India -- the move has meant real hardship. “I need 2,000 Rupees ($30) to buy medicine for my wife who has paralysis,” Delhi resident M. L. Grover, 75, told CBS News as he waited outside a bank. He managed to persuade the others in the long line to let him jump ahead, but the ATM ran out of cash. “I will now check if any other ATMs nearby have cash,” he said as he walked away. India is primarily a cash economy; 78 percent of all transactions last year were made in cash, the highest among emerging global markets, according to a joint report by Google India and The Boston Consulting Group. Britain-based PricewaterhouseCoopers says cash is used in a whopping 98 percent of consumer transactions in India. Digital payments aren’t expected to surpass cash payments until 2023. The majority of shop owners and customers in bigger markets across the country prefer to deal in cash. Many of them intend to go digital, but for now, there is a struggle for cash – and it’s creating a void in business. “Banks told us card debit swipe machines won’t be available any time soon, so we are helpless,” Anil Kumar, a shopkeeper at Delhi’s Lajpat Nagar market told CBS News. But the government is clearly keen to move that timetable forward, pushing hard for a cashless system, in spite of the huge gap remaining. Smaller businesses like buses, auto-rickshaws, roadside food stalls and small shops that cater to people’s everyday needs are all cash-only, and they’ve been hit hardest. He was waiting along with a bunch of other auto-rickshaw drivers, all of them keen to show the meagre amounts they’d earned. They say business is down 75 percent. While many have welcomed the decision, describing it in military terms as a “surgical strike” on black money, they’ve criticised the manner in which the government implemented it. And tea-seller Yadav’s sympathy with the government policy was hard to find elsewhere at street-level. Economists are divided on whether the decision will benefit or harm India, where only 1 percent of citizens pay income tax. “The fight against corruption and black money in India has just begun. If successful, this will go down as the biggest reform in India,” wrote Surjit Bhalla, head of an economic research firm, in the Indian Express newspaper. Many other economists believe the banks will get massive deposits, and could in turn lower interest rates and lend more for new businesses. Several opposition parties are demanding the decision be scrapped, but Modi’s government has made it clear there is “no question” of a rollback. There have been limited efforts to help elderly people and others at the most risk under the new currency rules, and Modi has hinted that more such steps could be taken, but many agree he’s made the biggest economic and political gamble of his career.